To hear Sophia Foster tell her life story one could be forgiven if one thought her a war veteran rather than a veteran entertainer. In her travels – or should that be travails – around the country and those on South Africa’s borders, she has had some hair-raising experiences in what was then the region’s hotspots. She worked in war-torn Mozambique and was told to leave Lourenco Marques (now Maputo) in a hurry. She had a stint in Lesotho and had to flee in the middle of the night to find her way to the border. In the old Rhodesia, a bomb went off at a show she had been asked to do but had opted for another gig. Those are just some of the hairy moments Sophia has had to endure in what can only be described as a “colourful” career in entertainment that spans six decades. 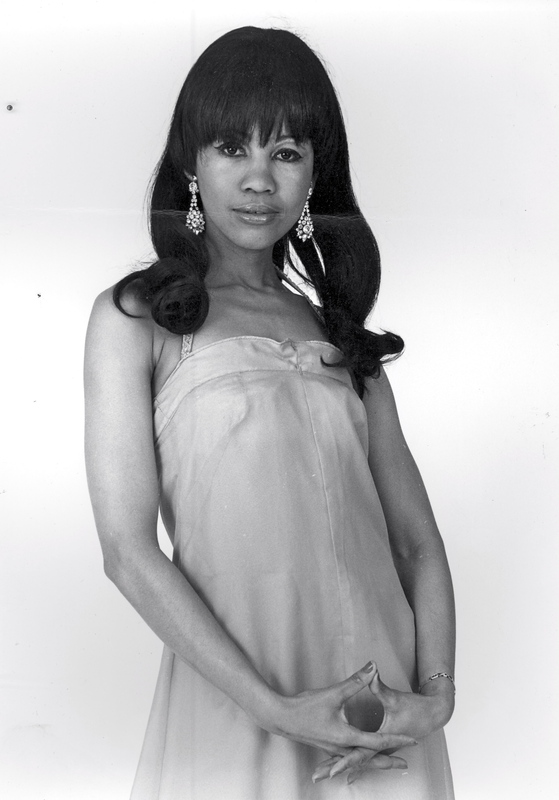 It’s a career that started in the late Sixties when she left home and linked up with the travelling entertainers, the Golden City Dixies, initially as a dancer but it soon developed into more of a singing career. “I sang in a few choirs as a kid,” Sophia recalls. “The start with the Dixies came about because my next-door neighbour sewed the costumes for them. That nasty experience at the beginning didn’t dull her enthusiasm. Rather, it steeled her resolve and put her in good stead to survive on the road. “Although I auditioned with the Dixies as a chorus line dancer, Nancy Weber, the costume woman, told them I could do a bit of singing as well. “They tried me in a duet and the first one, Where the Boys Are, was with Ruweida Harris. She had such a beautiful voice. Artists Sophia worked with in the Dixies included Lawrie Hartzenberg (he has been a big name in Ireland for many years), Miley Martin, Don Stanton, yodeller and mime Jonathan Stevens from Durban, Neville Lingo, Cyril Valentine, and Terry Smith. She is pretty frank about the hardships and conditions in touring with the Dixies and her feelings about some of her co-performers. “I can’t say I enjoyed being on the road with some of those guys,” she says. “They used to get drunk and gerook. There were lots of fighting, chasing women and girls, and even violence on women. “We slept where we performed. On the roof of our bus were our suitcases and stretchers. After the shows, as soon as the curtain came down and the audience had left, the girls would bed down on stage and the men would organise sleeping arrangements elsewhere. “We also stayed in schools during holidays, different classrooms for the men and women, married couples were given their own classroom. Being a black entertainer and touring in apartheid South Africa brought with it its own set of problems for the entertainers. “There really was no freedom of movement in those days, the places where you performed had curfews,” Sophia recalls. “Two of our guys were caught out late one night. Some of the guys in the troupe had a habit of going on the prowl for girls as soon as we hit a town. They would try to pick up anyone who was available. “Those years, the boere (cops) were really hectic, they would come and whistle and scream and clap in the shows but when you walked through town the next day, it would be a case of daar gaan daai hotnot van die show. “I’ll never forget the incident with our whistler, Dave Klaasen, and our tap dancer ‘Doring’, from Jo’burg. “They were caught after hours and arrested. They begged the boere to let them go. They asked the boere if they had seen them in the show. They had apparently heard of the show and asked what they did. ‘Doring’ asked them for cool drink tops and glued it or nailed it under his shoes. They whistled and tapped their way right out of the police station cells! “Someone once beat up Dave, so he couldn’t use his fingers to whistle. No problem for Dave. He used Sammy Hartman’s hand to whistle. ‘Doring’ had no training — none of us really had training – but he was amazing. Drummer Gilbert Matthews would play and ‘Doring’ would tap to anything Gilly played. “And then there was Victor Sampson. He could do Johnny Mathis better than Mathis. We’ll never see the likes of them ever again. As a youngster on the road, Sophia had to learn to take care of herself very quickly but she did have some help along the way. She credits seasoned Durban singer Vivienne Kensley with providing her with some protection away from home. She also has fond memories of the tour experience with the Hartman family. “Sammy had half the Hartman family on the road with him . . . his uncle or brother drove us, sister Roslyn was a chorus-line dancer, and his mother was cook. She was very strict. No way Sammy was going to get up to any kind of mischief, he wasn’t even allowed to hang out with the girls. 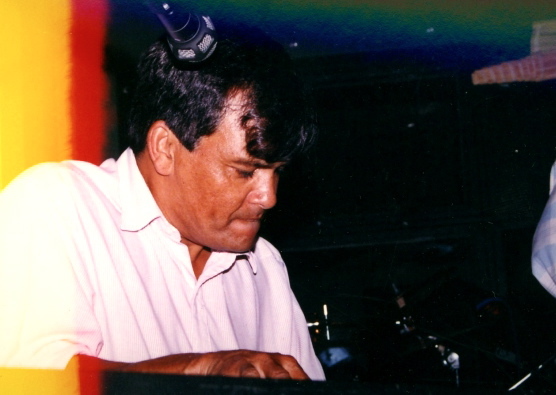 Keyboard maestro Sammy Hartman. He toured with the Golden City Dixies with Sophia as a child prodigy but had his family with to shield him from anything untoward. Her ordeals on the road taught her some life skills that came in very handy later in life – like cooking and driving. On one of her tours with a promoter from Port Elizabeth, she ended up having to cook for the group and driving the rented vehicle. “One day we woke up in some town and found out he had driven off in his posh car with the takings,” Sophia said. “So we decided to run the show ourselves. We had a vehicle to transport our equipment and us. “Whatever money we had we used on petrol and food. I took over the cooking – there were no Hartmans on that tour. I would go to peoples’ homes – I’d look for the coloured areas where we would park the bus and then knock on some door to ask to cook a pot of food for the troupe. Sophia’s assertiveness, ambition and independent streak could not be denied forever. The Dixies had served its purpose and she was ready for the next part of her journey. “I realised quite early on that the Dixies was a male dominated set-up and to progress in my career, I needed to get away,” Sophia said. She moved on to Lourenco Marques (Maputo) but it came to a sudden halt when she was advised to leave because the overthrow of the Portuguese colonialists was imminent. “I was also working in Lesotho when there was military activity. The apartheid South African government was landing helicopters late at night, looking for ANC cadres. It was scary. It was terrible to wake up the next morning and see the devastation they caused. “I was on stage one night when a bomb went off in the toilet. We had to run, just grabbing our passports and headed for the car in the parking lot. We couldn’t cross the border because it was closed at night, so went to next hotel, where other friends were, only to be told they too had to evacuate because of a bomb scare there. “In Zimbabwe [then Rhodesia], I was working in Salisbury and Bulawayo. I did Bulawayo and was asked to go to Salisbury because the singer couldn’t do it. But I couldn’t do it because I had another booking in SA. Had I gone, I could have been blown up because a bomb went off in that venue at a lunch hour show where I would have been performing. Her husband encouraged her to go to Europe, telling her she had done everything she needed to do in Southern Africa and needed to broaden her horizons even more. She went to Frankfurt where a relative introduced her to someone who was managing people like the Pointer Sisters and Sister Sledge. He organised her some gigs for which she laid down backing tracks. “I based a lot of my vocals on Shirley Bassey’s work. Then I started listening to Lena Horne and Shirley Vaughan and my absolute favourites Tina Turner and Aretha Franklin. Her next step in developing her career and personal growth took her away from the musical extravaganza type shows to her one-woman Hey Sister and Nancy’s Dues shows. The Hey Sister show came about after friend who worked in theatre urged her to take something to the prestigious Grahamstown Festival. “I had no idea about the Grahamstown event because I had been travelling so much. People went there to showcase their stuff and others went there to window shop for shows. Sophia’s travels had come full circle by the beginning of the ‘90s. She was back in Cape Town with a new husband. It was still the old South Africa and that meant she needed a permit to live in Woodstock with her new husband. She says, without much evident rancour, that while they lived in Johannesburg they were forced to move six times because of the Group Areas Act. The next big thing was her tribute one-woman show to Nancy Wilson, called Nancy’s Dues. “I was fascinated with this one particular song, Guess Who I Saw Today. I went out and bought the music, loved it and learnt the rest of the songs and that became one of my favourites songs in that show. Sophia is very upbeat about the prospects of the current crop of young female entertainers. She says there are many with great voices but felt a lot needed that little something extra to get ahead in the game. Her commitment to advancing the cause of female entertainers has not gone unnoticed in certain quarters. Last year she was asked to direct a show, Women In Song, that was put on at Artscape (the old Nico Malan Theatre that was the premiere arts venue for whites in the old Cape Town). “That was quite a challenge for me. Artscape is now a true community facility offering opportunities for everyone. The person at the top asked me if I would direct a women’s show for Women’s Day last year. I brought in nine female singers — of diverse backgrounds – and my band was mostly female with just a male saxophonist. “At first it was a rather daunting task but then it just got easier with me rehearsing and shaping the show. As it came together, I realised I was in my comfort zone because I was on the other side all the years and I knew what was required. Sophia has no idea how long she will go on entertaining. “To be honest, in a small way, directing is my way of still being a part of it, not the solo performances. “I’ve recently done a jazz cruise and I’ve just done Grand West arena. I still get bookings for shows, but I’m not as enthusiastic and as excited like I used to be. It’s a gig. I put it all together and I can still wow the audience. A lot of talent and experience here . 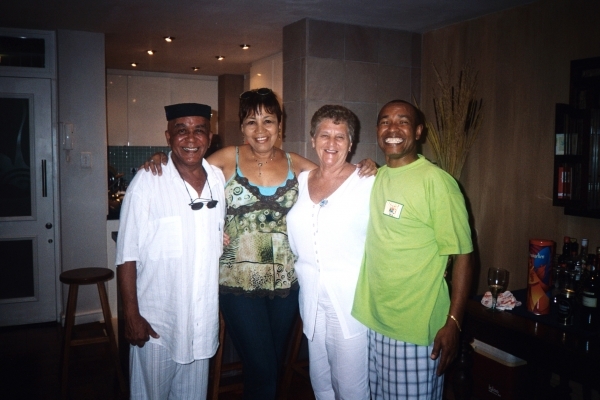 . . Sophia Foster with a few of her entertainment friends, Terry Fortune, Zelda Benjamin and Leslie Kleinsmith. Who is game enough to ask for ages? Could it be that her birthday last month is influencing her future directions. Sophia hasn’t always been forthcoming about her age (so her close friends tell me) and with that demure visage it hasn’t always been easy to pin it down. But her recent birthday, while not of biblical proportions, was certainly biblical in nature. “I recorded a single, Too Hot To Handle, many years ago and I also made a music video at a time when not one artist in SA had made a music video. It was new and it was current. “I have actually been asked to re-release Too Hot To Handle. But if I had to put out an album now it would probably to be in the genre of the Nancy Wilsons . . . laidback music but very much stuff with a message in the lyrics and tie it in with the life I have lived, whether it was happy or sad. Any tribute to Sophia would have to involve those extravagant costumes. It was her “signature” thing. “I remember Yvonne Cloete who, apart from having the most powerful voice I have heard in my life, used to dress so beautifully. She paged through magazines and look at overseas artists to see the way they dressed. I promised myself that one day I would dress like that. “Meanwhile, my first beautiful, ‘elegant’ costume was made of lace curtains! What made it hard to pick that it was lace curtain was the fact that I had ostrich feathers on the edge of the costumes and on the seam. Feathers very expensive at the time and I lay-byed it and paid it off before I could put it on the actual costume. “Geez, people used go mad when I walked on stage in that dress. Over the years I have managed to shop in Vegas and my husband loves walking with me into a shop and seeing me try on sequin dress. I have costumes that you will not believe. I’m just a clothes horse. Sophia and husband Craig now leads a more sedate life in Cape Town. It’s a far cry from the teenager who made the local paper because she ran away from home . . .
We look forward to the tribute show – whoever puts it together! This material is copyrighted. Prior approval has to be obtained before any reproduction. Great story about a fascinating personality. Go for for it Sophia, you’re just getting your legs now. What an entertaining take on nostalgia. Love it. Great article, write a book!!! Hi Ludski just reading all the names makes one feel the nostalgia that flows from this blog. ….more boet!!!! Now if only you can unpack that garage of yours, then we can really feel the nostalgia that flows from those precious items of TK’s you have among the rubbish. Doen it, boet!!! You’re the best. I wish I could hear you again.